Born March 11, 1836 at Perryville in Boyle County, Kentucky. 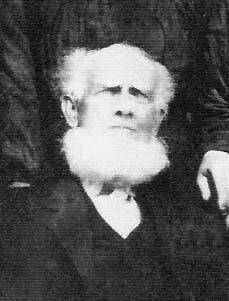 Father was John Richardson (18__-1896). Mother was Mary ____________________ (18__-1843). His first wife was Mary E. Clyde (18__-1861). They married November 19, 1860 at Hodgenville, Larue County, Kentucky. Their only child was John T. (Sept. 20, 1861). His second wife was Elizabeth E. Rodarmel (18__-1902). They married May 10 or 15, 1867 at Petersburg, Pike County, Indiana. Their children were Iola A. (April 4, 1868), William L. (Jan. 29, 1871), Joseph E. (June 14, 1872), Elis O. (Dec. 14, 1874), and Nathan A. (Feb. 6, 1881). According to his military service pension records, Elijah Richardson was a 26 year old "Farmer" residing near Winslow in Pike County, Indiana when he volunteered along with his brother Joseph B. Richardson. They were enlisted by Captain Sasser Sullivan on August 29, 1862 into what became Company H of the 80th Indiana. They were following in the footsteps of their step-brother Robert M. Henry who had enlisted 10 days earlier. Elijah was mustered into the Union Army at the rank of Private for a 3 year term of service on September 5, 1862 at Camp Gibson near Princeton, Indiana. At that time he was recorded by the Army as being "6 feet 2 inches" tall with "blue" eyes, "dark" hair, and a "dark" complexion. At that time Co. H consisted of 3 officers and about 95 soldiers. It was commanded by Captain Sullivan with 1st Lieutenant John J. Collins (second in command), 2nd Lieutenant James F. Ruark (third in command) and 1st Sergeant William H. H. Ivy (fourth in command). Elijah and his brother were present with the 80th on October 8, 1862 when it took part in the bloody fighting at Perryville in Boyle County, Kentucky, where they had been born. This was the first time the regiment was in combat ('saw the elephant' as they said back then) and it took place just 30 days after it had first drawn its uniforms and weapons. During 2 hours of heavy fighting the 80th lost 25 men killed, 116 wounded, and 16 captured out of the 738 men it took into the battle. This was a 27% casualty rate, and amounted to 45% of all casualties the regiment would suffer during its entire service. In Co. H, 2nd Lieut. James F. Ruark was mortally wounded, Pvt. Nathan R. Beadles was killed outright, and Elijah's brother was wounded. The following is taken from a letter Elijah wrote on March 11, 1902. "Just before going into the fight, i past my fathers old home where he youst to live. it was a farm house clost to wher the fighting took place. my brother joe was badly wounded in the fight. i stayed with him in hospitle untill the last [of] november  then i went to my regmet (regiment) found it at Glas Co [Glasgow in Barren County, Kentucky], redy to march." In his letter Elijah states that he then went with the 80th to Columbia in Adair County, Kentucky, where he was detailed as a Nurse in a "measles hospital." It was there that he was taken prisoner by Confederate Cavalry raiders under the command of the famous Colonel John Hunt Morgan. Elijah's letter describes what happened. "on the first day of january, '63, on new ers (New Year's) day we were all captured bye morgins kentucky Raiders. thare were 90 of us in all, sick and nurses, [Corporal] Robert M. Henery, my step brother was with me. we were all swrn to wRiten paroles as prsisners. next day him and i reported to our regment, the 80 company, H. the curnel [the 80th's commanding officer Colonel Charles Denby] sed he had no controle over us But he could advise us what to doo. tolde us we could go home if we wanted to, so we reported to govner morton [Indiana Governor Oliver P. Morton] n 30 dayes so we don so and were home three weakes then we repoorted to the govner, was sent out to the Exchange Barox (barracks) stade there all winter. In May the 7 i was Exchanged Back to the servis went to my regment..."
Shortly after reporting to Governor Morton, Elijah's brother Joseph was discharged from the Army effective January 31, 1863. In August Pvt. Richardson accompanied the 80th as it departed Kentucky and marched over the Cumberland Mountains as part of a large Federal force under the command of US Major General Ambrose E. Burnside. Their orders were to capture eastern Tennessee from Confederate forces. The 80th spent a very cold, miserable, hungry winter in Tennessee, primarily at Loudon, but also at Strawberry Plains and Mossy Creek. Elijah's letter tells what happened next. "in the spring of '64 we started with shearmans [US Major General William T. Sherman] force throug' georga on the atlanta Rail Road..." This was the beginning of Sherman's famous 4 month campaign to capture Atlanta, Georgia. Early in that campaign, the 80th took part in the bloody fighting at Resaca, Georgia, on May 14, 1864. There it suffered 26 killed and 100 wounded out of the 270 men who were ordered to take part in a doomed charge against entrenched Confederate troops. This was a 47% casualty rate, one of the highest of any Federal unit in the battle. One of the wounded was Corp. Richardson, who received a "Gunshot wound of left arm with extraction of bone and left hip wound." In his letter Elijah said the following about this. "...was in the hotest of the Batel at Resaca, wher i was wounded on the 14 day of may, 1864. that ended my servic at the frunt, never seen the regment any more..."
Over the next few months Corp. Richardson was treated in various military medical facilities. On August 3, 1864 he was admitted to the General Hospital at Jeffersonville, Indiana (just across the Ohio River from Louisville, Kentucky) where records show he was assigned to Bed 76 in Ward 5. Corp. Richardson remained there until December 5, 1864, when he transferred to the U.S. General Hospital at Quincy, Illinois, where he was admitted December 8, 1864. It was there on April 4, 1865 that he was honorably discharged from the Army due to having been disabled by his wounds. In Elijah's pension records is the following description of his wounds, written in 1865. "[The musket] Ball entered the left arm cutting away two inches of the elbow carrying away the joint and then entered the left hip shattering the bone..." The doctor examining him stated that Elijah's left arm was totally disabled. For his wounds the Federal government granted Elijah an Invalid Pension of $8 per month, retroactive to his discharge in April, 1865. In 1884 Elijah was living at Fidelity in Pike County, Indiana and receiving a disability pension of $24 per month. By 1903 his pension was $46 per month and was $72 per month at the time of his death at age 86 in 1922. A footnote to Elijah's letter states that during his entire military service he carried a book published in 1823, "Devout Exercises of the Heart, in Meditation, and Soliquy, Prayer and Praise" by Mrs. Elizabth F. Rowe, which is said to have been a gift from a comrade, Robert A. Black. For more about Corporal Richardson's experiences during the war, click the 80th History link below to read what happened during for the months he was present with the unit. If you have additional details about him that you would be willing to share, then please contact Scott C. Meeker using the link below. Sources: Genealogical information courtesy of Elijah's Great Grandson John W. Wineinger; Civil War Pension Records by Office of Adjutant General of the United States (Washington, DC); and Regimental Descriptive Rolls, 1861-1865, Volumes III, IV, and VIII, Report of the Adjutant General of the State of Indiana (Indianapolis, Indiana, 1866). All Rights Reserved. Created December 4, 2004. Last updated December 4, 2004.